There is no “right” or “correct” way to purchase gold bullion, but there are ways of going about a purchase that are better than others. First and foremost, to be able to purchase gold with little to no restrictions it is going to require a bit of disposable money. Because gold is so much more expensive than its silver counterpart, you’ll need much more than a few hundred dollars if you want to make any type of substantial investment in the yellow metal. Believe it or not, most often purchasing gold in bulk quantities is not only the smartest way to invest in the metal, it is also the most profitable as well. While profits can never be guaranteed, by investing in precious metals you are doing a great favor for yourself in terms of return on investment. In the following few sections you will be informed on all the ins and outs about purchasing gold in bulk and just how it may serve you some benefit. 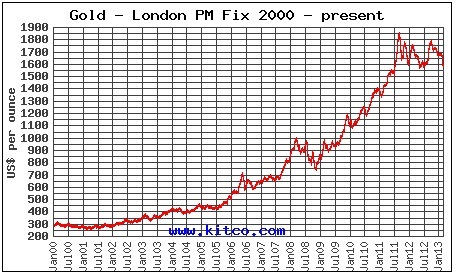 The spot value, when talking about precious metals, is the current market value of the gold present in a given bar. Since the value of gold is always changing, much like stocks on the Dow Jones, it is every investor’s responsibility to keep up to date with the most recent values and value changing. While it would be ideal to purchase metals at or under the current market value of the yellow metal, that is an occurrence that rarely presents itself. Instead, online and brick and mortar dealers alike charge what is called a premium over spot. This premium is an extra amount of money that dealers tack on to the bottom line of the gold bullion in question. You may be wondering why dealers would add any extra money to the price of an already expensive metal, but without a premium gold and silver dealers would not be able to cover the cost of business or even have a chance of deriving a profit. And after all, aren’t all businesses in existence to make a profit? When you purchase gold, the smaller amount of the metal you purchase the higher the premium will be; proportionally of course. This means that as the amount of gold you buy increases more and more the premium begins to vanish at an alarming rate. In some cases, a bulk purchase of gold will see your premium make almost no difference in the overall price of your investment. If it weren’t for the decreasing premium, online and brick and mortar dealers alike would have a hard time getting rid of their massive quantities of stock. No dealer likes hanging on to a lot of product at one time without selling it so the decreased premium on bulk orders of gold is beneficial for everyone involved. It is still your duty to search around different precious metals sites in order to get the best value for your money. You would be surprised as to the disparities in prices of bulk orders from site to site. Just when you think you are about to get a great deal, you may go to a different site and end up with more money left in your pocket than you ever would have imagined. A lot of prospective bulk investors understand that large purchases of gold will lead to a lower premium, but certain people would like to avoid premiums altogether. These people think that they will beat the system by purchasing gold from a mint directly. This sounds like a fairly solid plan from the outside, but it simply will not work. The fact of the matter is that nearly every mint that exists on this world will not sell to private investors. Instead, these large companies reserve their services for private gold and silver selling dealers (the very ones you and I buy from all the time). If you are not a licensed precious metals dealer you will have a difficult time getting your hands on a bulk purchase of gold. Unless you are looking to purchase hundreds of thousands of ounces of gold at one time, a task that would cost you hundreds of thousands of dollars, most mints will shut you down in a matter of moments. Instead you should concentrate your efforts on finding the online dealer who will give you the best deal on a bulk purchase. Another tactic that precious metals dealers employ in order to coerce investors to purchase bulk amounts of metal at a time is by offering you free shipping on orders of a certain size. As you are well aware of, shipping costs are determined by the weight of the metal you are purchasing. As shipping costs begin to add up, so too does the premium you are going to pay which means that the gold you are buying may end up costing you much more than you had originally thought. Some online dealers will offer you an extremely low premium per ounce and give you free shipping if your order is above a certain amount. With that being said you may think that you will be required to purchase hundreds and hundreds of ounces in order to receive free shipping, but the reality of the matter is that an amount around 20 ounces will likely be enough to warrant free shipping and handling. Not every dealer is created equal and it is this fact that makes it your responsibility to search and compare different metals dealers. By doing even the bare-minimum amount of research you are insuring that you’re one step ahead of the people who simply settle on the first dealer they come across.